Returning to Vietnam was no sentimental journey for Bob Ruybal after 50 years. The 71-year-old North Port resident was a member of the 101st Airborne Division chewed up on “Hamburger Hill” by North Vietnamese Army units in May 1969. “I had no desire to go back to Vietnam. When I returned from Vietnam we were spit on and cursed at by our own people,” he said. “Karen, my wife, was the one who always wanted me to go back. “We’ve been married 47 years. We became pen-pals during the war. When I returned from war we got married. This year his wife booked an eight-day package tour of the country that included airfare, first class accommodations, food and in-country transportation for two for a total of $2,145. “When I stopped out of the plane in Hồ Chí Minh City I expected to smell the gas fumes and napalm like what I smelled when I got off the plane 50 years ago. In those days helicopters were going through the air and jets were flying over the military was everywhere. This time I was impressed, I was’t overwhelmed by the fumes produced by the military, it smelled like Florida. “When I left Saigon in 1969 it was a war zone. Biên Hòa, where I was stationed with the 101st., was right next to Long Biên Airfield. Today Biên Hòa is a beautiful resort town with a golf course. “Our guide who came with us was from Hanoi,” Ruybal said. “He explained after the war ended in 1975 and the U.S. pulled out, the country fell to North Vietnam within six months. During the next 10 years South Vietnam became a Communist-run country dependent on Russian foreign aid. “Then the Russian aid stopped and things got really tough for the people of South Vietnam. If a family was given 10 chickens to raise and the chickens produced 10 eggs a days the family had to return nine of the eggs to the government. It could only keep one. “If the family slaughtered one of their chickens it got to keep the neck, feet and wing tips. The good parts were returned to the government. “After 20 tough years the Vietnamese government was unsustainable as a Communist entity. At that point, under a new Communist chairman, the country became a combination Communist-Capitalistic regime. Then the country was opened to trade from around the world. “Lots of big American companies invested in Vietnam. Canon camera from Japan came to Vietnam and so did other firms from South Korea. Vietnam today is one of the top five countries in the world where Americans go to retire in the Central Highlands. Living is so affordable and safe. “We had dinner one night at our five-star hotel on the roof-top in Hồ Chí Minh City. A complete meal with hors d’oeuvres, main meal, desert, and drinks came to $21 total for both of us. “On our tour we spent four days in Hồ Chí Minh City. The people were so friendly,” Ruybal said. “Saigon is a beautiful, cosmopolitan city much like many big cities in the U.S.
“Our group was offered a tunnel tour when we flew to Hanoi. I said, ‘no’ because I lived through that during the war and I didn’t want to do it again. Hanoi was completely different experience than Saigon. It’s an old city influenced by the Chinese and less influenced by the French like down south. “We took a five-hour drive to Hạ Long Bay, a beautiful resort area on the South China Sea near Hanoi. We spent time driving around there. Hạ Long Bay has these gorgeous mountains coming out of the middle of the bay. 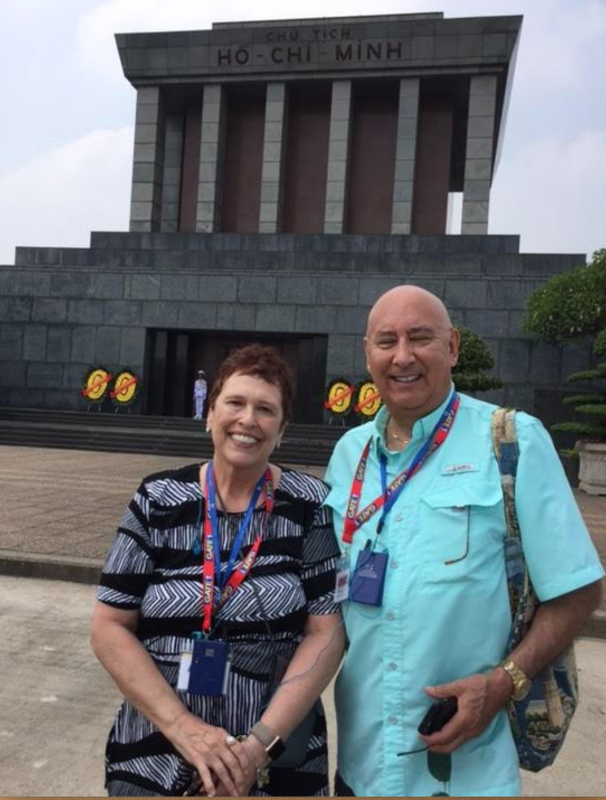 “Karen and I saw the changing of the guard at Hồ Chí Minh’s mausoleum in Hanoi,” Rubyal said. “It is very similar to Arlington. They have a changing of the guard on the hour. It’s very respectful and very nicely done. “Hồ Chí Minh died three years before the end of the Vietnam War. His goal was to be buried in Saigon. When the war ended, after his death, they kept his body in Hanoi and renamed Saigon Hồ Chí Minh City, in his honor. “I’m so thankful we didn’t destroy that country. It’s recovered and is thriving. The people of Vietnam have no animosity toward the U.S. Looking back on their trip to Vietnam, Ruybal said, “Karen knew what effect the war had on me. All these years I said, ‘No, no, no. I didn’t want to go back.’ I’m so thankful she convinced me to go. I would highly recommend that anyone who fought there during the war and has bad memories of the place should make the trip. It’s worth every second of it. Click here to view Ruybal’s part one. This story was first published in the Charlotte Sun newspaper, Port Charlotte, Fla. on Veterans Day, Sunday, Nov. 11, 2018, and is republished with permission. We’re with you on that one, Henry!